This has become an annual tradition for my husbands birthday! 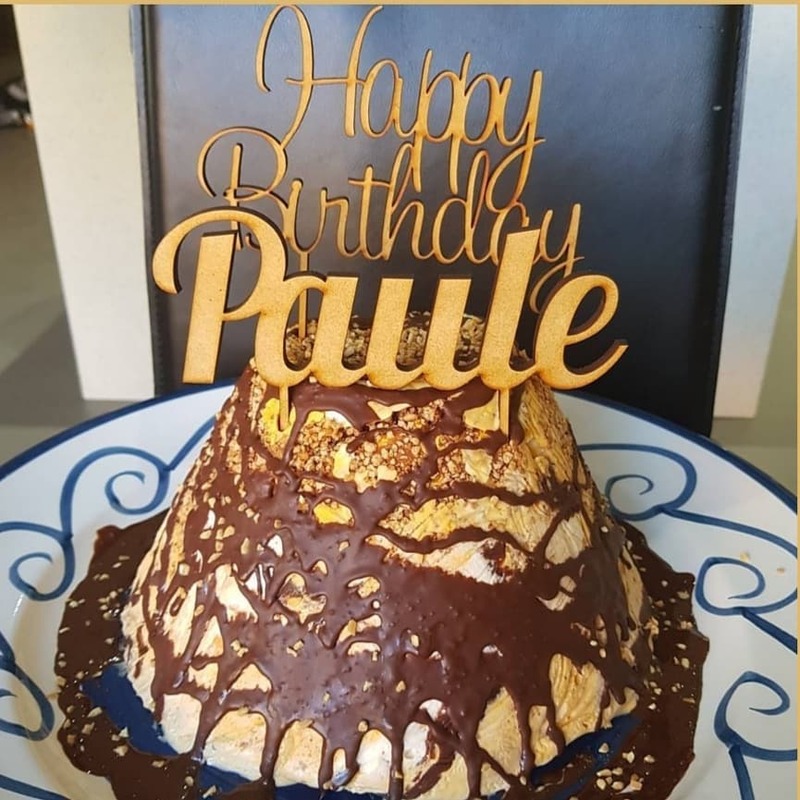 For my husbands 30th birthday a few years ago, I asked him what cake he wanted for his birthday, he requested a Golden Gaytime Icecream Cake (…as a joke). 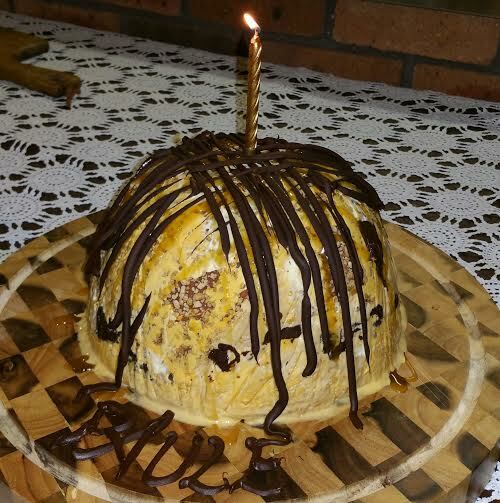 But what my husband wants, my husband gets…even when his birthday in the middle of winter! 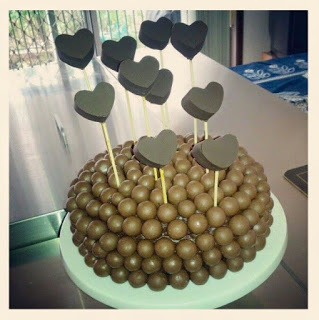 This has been a birthday tradition now and is the EASIEST and YUMMIEST “cheats” cake ever!!! I prepare it at least the day beforehand and it is really quick to plate up when time to serve. 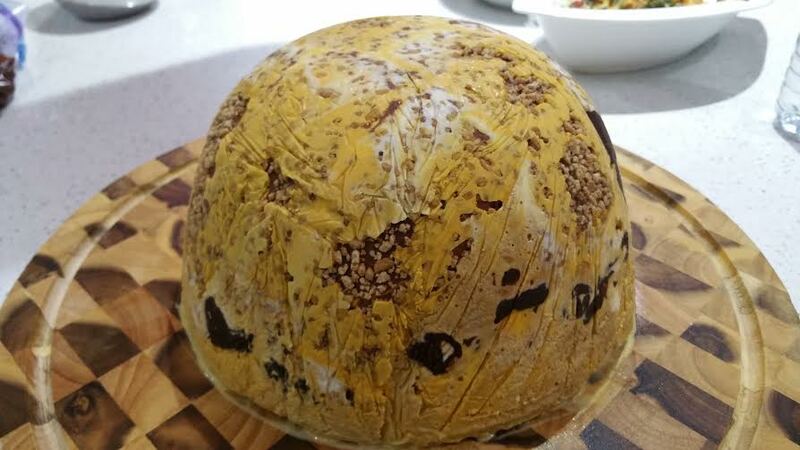 My first cake was inspired by this Golden Gaytime Icecream recipe by Excuse Me Waiter and I have adapted and changed it over the past few years! The first 2 years were pre-Golden Gaytime icecream tubs, so this time I used the Golden Gaytime Icecream tub to top up my glass mould. It really is the easiest cake to make and you don’t have to worry about leftovers going gross as it can always be kept fresh back in the freezer (…but you probably won’t have any leftovers!!!). Also great to prepare a few days earlier to leave time for other party prep! You can use any mould i.e. silicon, glass, metal. Silicon is the easiest for the icecream to pop out (without any spraying etc), however I have used metal baking pans in the past, and a Pyrex glass bowl this year to get a dome shape. I spray with cooking spray and double line with plastic wrap. 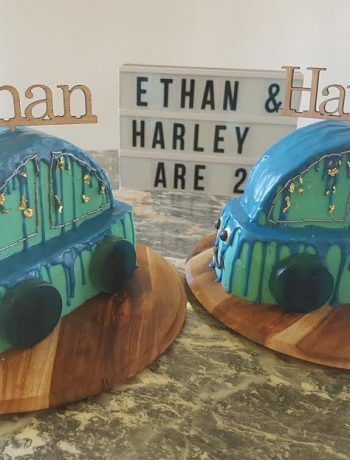 The cooking spray helps the plastic wrap stick onto the glass/metal, and also helps when taking the frozen icecream cake out! 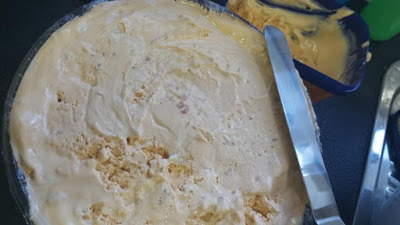 DO NOT put the icecream directly straight into a metal or glass tin/mould otherwise it’ll be a melty mess by the time you’re able to get it out and serve! 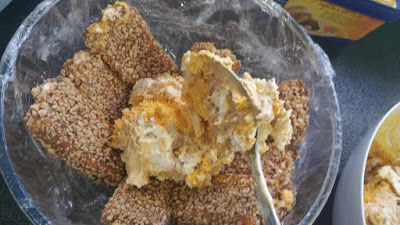 You COULD use your Thermomix for blitzing the biscuits, but I LOVE it chunky (as in some biscuits are just broken in half) as it gives a nice cakey texture amongst the icecream. 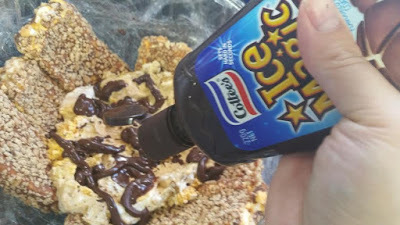 Also the ice magic through this, gives it that ‘Vienetta‘ type icecream cake texture with crunchy chocolate bits through it! 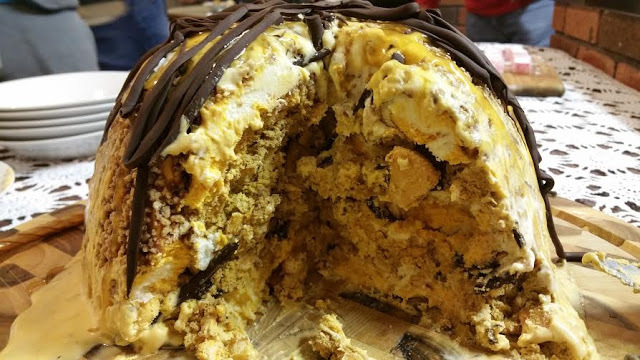 You COULD also make your own ice magic/chocolate sauce, and caramel sauce…and icecream etc etc… in the Thermomix, but this is a CHEATS cake, and it is just nice to just buy everything and bang it all in there in no time!! No special equipment needed, just a large mould/tin and large bowl!! Leave the icecream out on the bench for at least 10 minutes to soften. Prepare your tin/mould if using glass or metal – spray with cooking oil and double line with plastic wrap. Place the arrowroot biscuits in a zip lock bag and smash it with a rolling pin (or something similar). Keep bigger pieces too (as they are really nice and ‘cake like’ once the cake is set). In a large bowl, roughly and quickly mix the Caramel and Honeycomb Icecream with the smashed arrowroot biscuits. 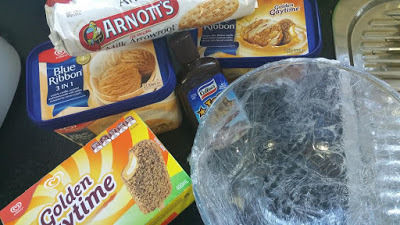 Remove the 8 x Golden Gaytime Icecreams from their packet and remove the paddlepop. Place the icecreams at the bottom of the tin/mould. …and roughly pour in the Chocolate Ice Magic between spoonfuls. 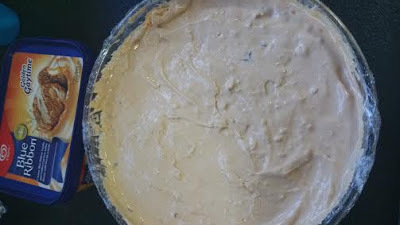 …and smoothen with a spatula so that it has a nice and even flat surface once it’s upturned for serving. Cover the top with 2 layers of plastic wrap and freeze overnight. When ready to serve, take out of the freezer for a few minutes, and melt your chocolate to drizzle over the cake (I just melt some in a ziplock bag in the microwave – a handful of chocolate chips in a ziplock bag, 30 seconds on high at a time until melted). Upturn the icecream mould onto your serving tray. If using silicon, it will just pop out easily, otherwise if using metal/glass, use a hot towel and give it a quick rub around the mould to soften the outside enough to slide out of the mould. 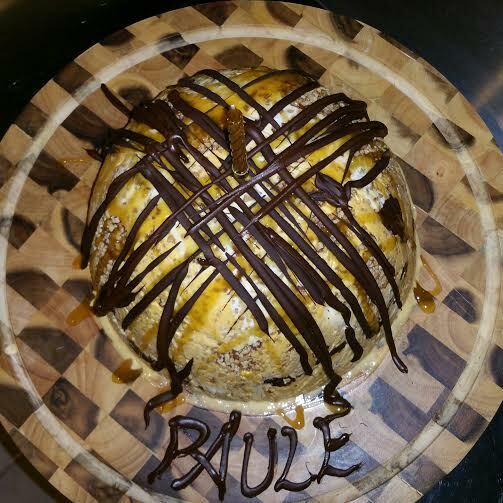 Pour caramel sauce and drizzle melted chocolate over icecream cake and serve immediately!! 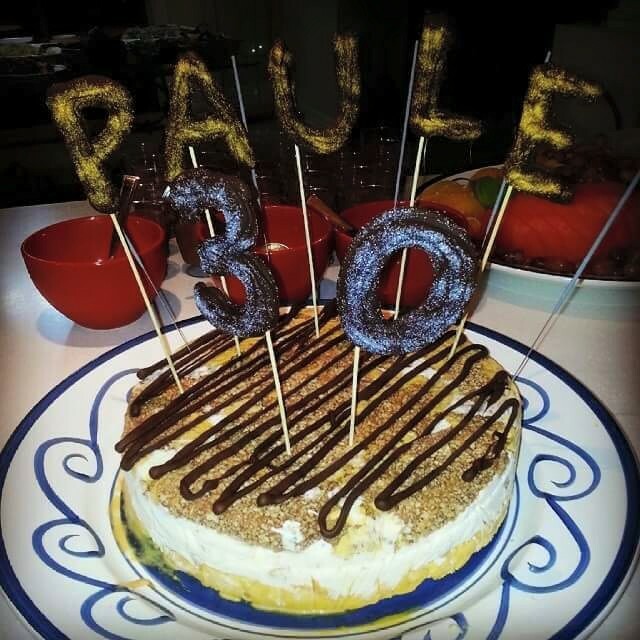 For my husband’s big 30th, I drizzled melted chocolate and topped with melted dark chocolate piped into his name onto a tray inserting a wooden skewer and topped with edible glitter, left to set in the fridge for a few hours. 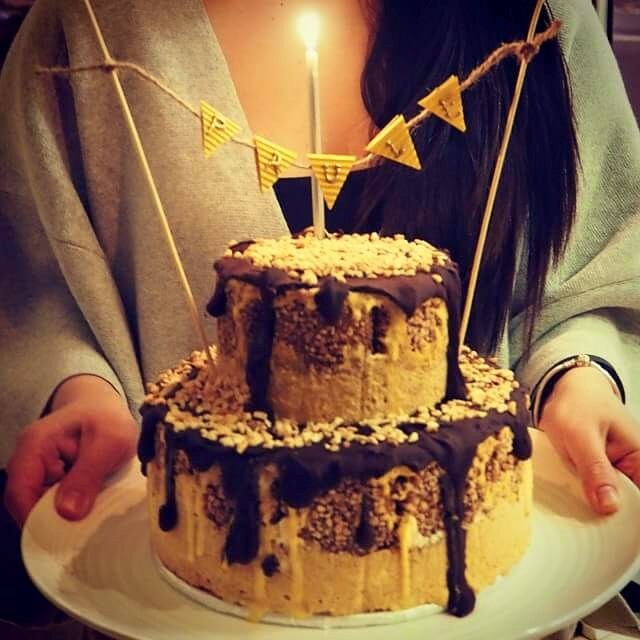 This was a 2 tier cake with dark chocolate ganache and crushed peanuts. I was heavily pregnant with the girls with this one so minimum effort! I used a glass bowl from Kmart and drizzled with ice magic and crushed peanuts. 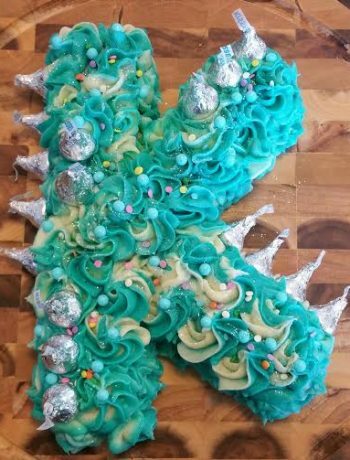 I used a 20cm round cake tin, drizzled with ice magic, decorated with Giant and regular sized Caramello Koalas to represent our family (it was his 1st birthday as a family of 6!) 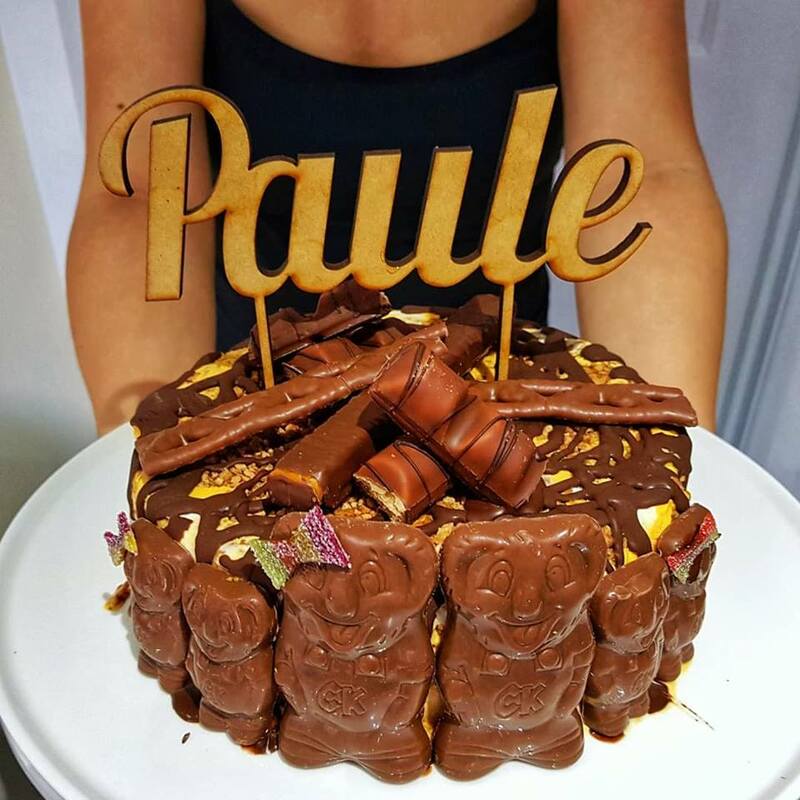 and topped with chocolates – Kinder Bueno , Curly Wurly and Chomp. 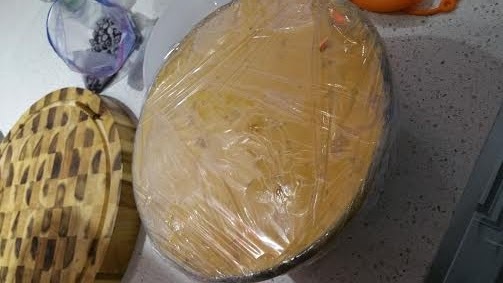 Prepare your large tin/mould if using glass or metal - spray with cooking oil and double line with plastic wrap. 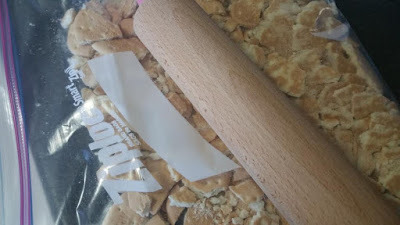 Place the arrowroot biscuits in a zip lock bag and smash it with a rolling pin (or something similar). Keep bigger pieces too (as they are really nice and 'cake like' once the cake is set). Spoon in the Caramel and Honeycome Icecream/arrowroot mixture and press down, and roughly pour in the Chocolate Ice Magic between spoonfuls. 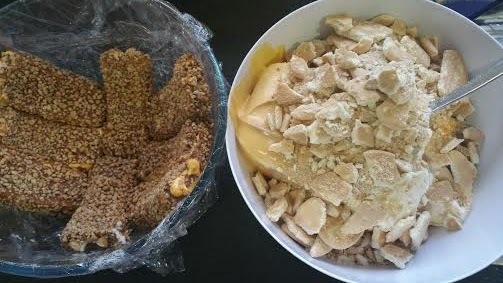 If there is room at the top of the tin/mould, spoon in icecream from the tub of Golden Gaytime Icecream till it reaches the top of the tin/mould, and smoothen with a spatula so that it has a nice and even flat surface once it's upturned for serving. 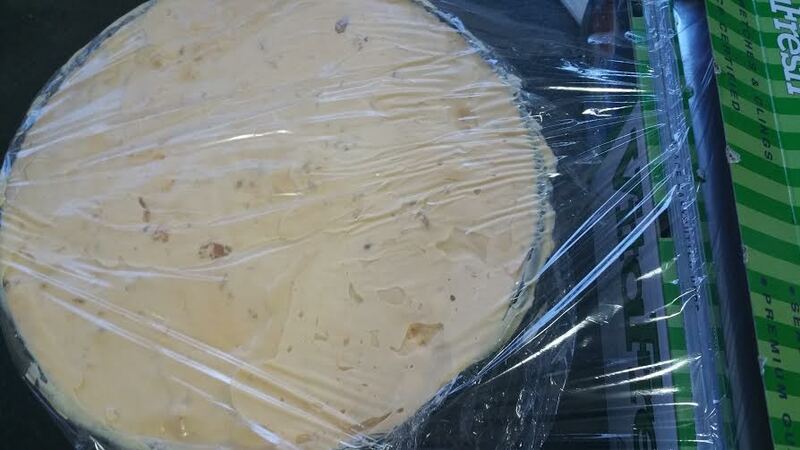 Cover the top with 2 layers of plastic wrap and freeze overnight. 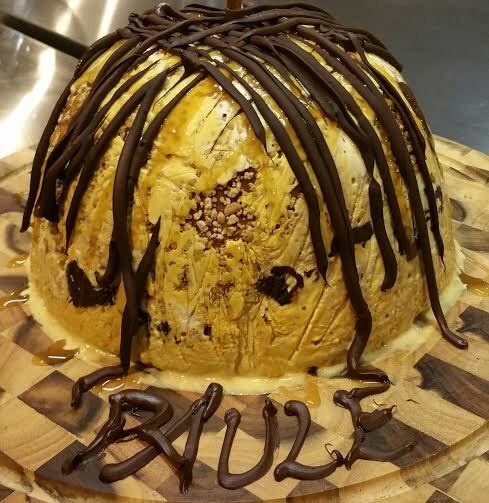 When ready to serve, take out of the freezer for a few minutes, and melt your chocolate to drizzle over the cake (I just melt some in a ziplock bag in the microwave - a handful of chocolate chips in a ziplock bag, 30 seconds on high at a time until melted).